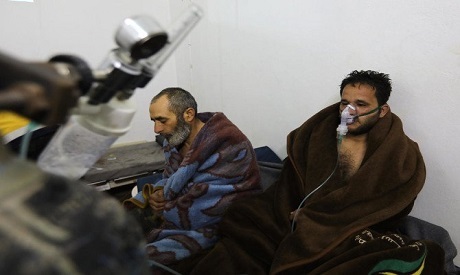 Banned chlorine munitions were likely dropped on a Syrian neighbourhood in February, an international body on chemical weapons said on Wednesday, after laboratory tests confirmed the presence of the toxic chemical. In its latest report on the systematic use of banned munitions in Syria's civil war, the Organisation for the Prohibition of Chemical Weapons (OPCW) did not say which party was behind the attack on Saraqib, which lies in rebel-held territory in the province of Idlib. The report by the OPCW's fact finding mission for Syria "determined that chlorine was released from cylinders by mechanical impact in the Al Talil neighbourhood of Saraqib." Samples taken from the soil, canisters and impact sites tested positive for other chemicals, bearing the "markers of the Syrian regime," said Hamish de Bretton-Gordon, a biological and chemical weapons expert working in Syria. "These chemicals were detected in previous sarin attacks, Khan Sheikhoun, East Ghouta and no doubt Douma," Bretton-Gordon said. The conclusions on the Saraqib attack are based on the presence of two cylinders, which were determined as previously containing chlorine, witness testimony and environmental samples confirming "the unusual presence of chlorine", it said. Reuters reported in January that tests found "markers" in samples taken at three attack sites between 2013 and 2017 from chemicals from the Syrian government stockpile. The mechanism was disbanded in November following a Russian veto at the UN Security Council, a move which ratcheted up tension between Moscow and Western powers over chemical weapons use in Syria.